In the winter months I love batch cooking soup so that I can take the soup to work in a flask for my lunch. Nothing beats a bowl of hot piping soup when its cold and miserable. Vegetable soup has no set recipe, you can add any vegetables that you have in your fridge and flavour it in any way you please. I love my soup to have a bit of a spicy kick so I like adding the soya sauce and the hot sauce, you can easily leave it out if you are making it for children or do not like spice. This is one of the easiest recipe to make vegetable soup. 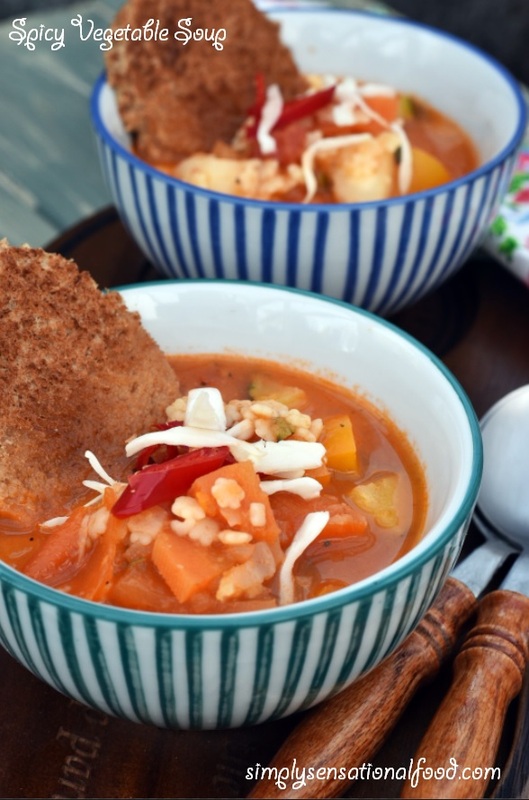 A spicy soup made with a medley of winter vegetables. 1. Add olive oil in a pan and when it is hot add the onions and saute until translucent. 2. Add the chopped tomatoes and all the vegetables and the water and bring the soup to a boil, once boiling lower the heat to a simmer and add the pasta. 3. Add the soya sauce, chilli garlic sauce, salt and pepper 4.Simmer the soup for 10 minutes until all the vegetables are cooked. 5. Using a spoon mash down some of the vegetables to thicken the soup. 6. Serve in soup bowls with slices of warm toast. Soup is the perfect food to get us through this cold spell! I especially love tomato soup. This sounds lovely. I've been obsessed with soups lately! I love how quick this soup is to make, like you I like to batch cook at this time of year. I like my soup to have a bit of a kick to it too! This sounds like the perfect winter warmer recipe. I love soups, especially during winter.Vegetable is one of my favourites as well so I will try this out. Sounds like such a yummy recipe! I tried out the 5:2 diet before but struggled with it due to lack of recipes. This is definitely a recipe I will use! Perfect soup for cold chilly season and also for flu season! I love how less calories it has! Definitely will help my diet plan! Tom loves spicy things! I'm definitely going to have to surprise him with this someday soon.. we're both trying to get more vegetables in our diets - I have a feeling this is going to work so well! 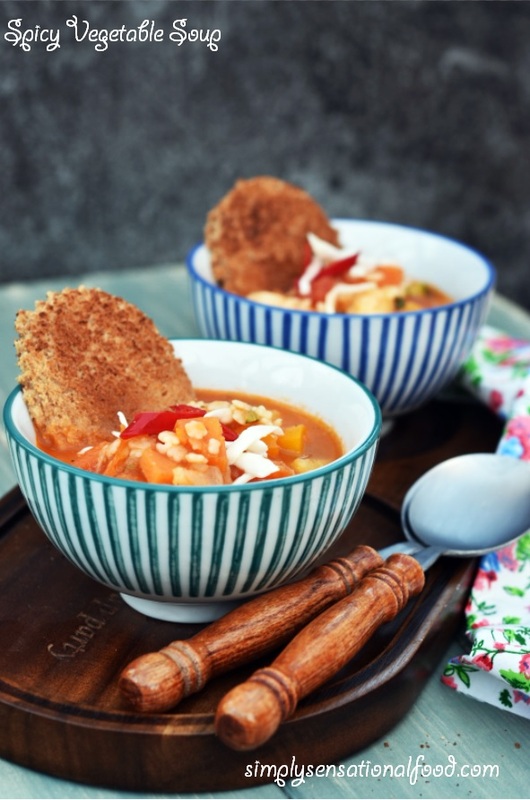 This soup is a must have this cold winter season! I just got over the flu and it was not a very pleasant time for me. I should have seen this recipe earlier. Oh well, I am fine now and eager to make this Spicy vegetable soup! Thanks for the recipe. The perfect 5-2 recipe! Low cal, easy but sounds like it packs a flavourful punch! Plus I agree - soup in winter is heaven. We make vegetable soup all the time and just throw in whatever we have that day :) This looks super healthy and warming! 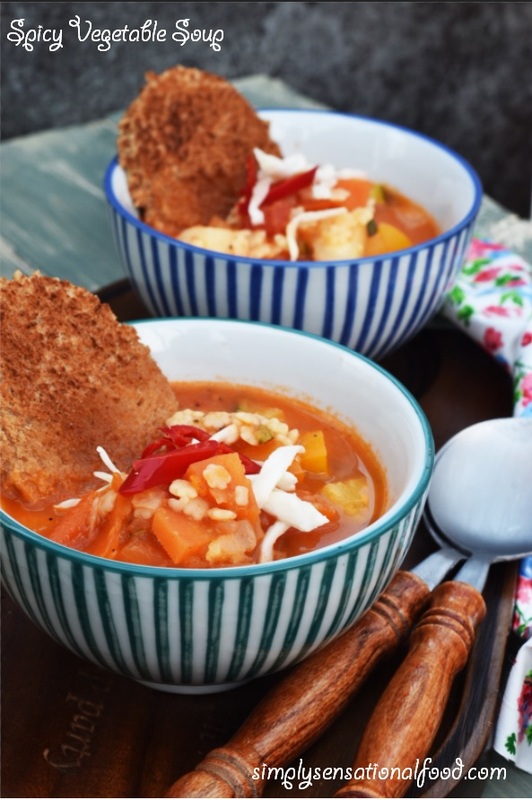 I love to have vegetable soup on hand for cold winter days! Lately, I've been eating the same soup every day because it's such a quick and easy recipe to whip up. I really want to start trying different types of soups. This recipe sounds delicious! I am a sucker for soup especially one that is jam packed with vegetables. Perfect for a meat free Monday dish. The soup looks absolutely flavourful and comforting. Dinners should be such wholesome bowls of veggies. Such an easy and simple recipe yet so flavorful! Perfect for this cold season. generally I prepare pureed or semi pureed soups, but never tried chunky vegetable soup. Easy and quick but delicious and flavourful recipe. Perfect soup for the perfect weather. Lovely clicks, welcoming recipe. Thank you Nayna. My family loves clear kind of soup with vegetables. This one looks very hearty and filling to try for them. I am in love with clicks.. literally feels like going into screen and hold it. Easy to make, full of flavors and filling... this one I'm going to make as I'm trying to eat healthy. Lovely soup, perfect time for soup. Liked those props of yours. Yummy soups.. I love it a bit spicier too. It is healthy with all the veggies added to it.